Moving Connections is a local professional moving company that provides affordable rates for residents and businesses alike. We are not part of a sprawling national corporation that will charge you an arm and a leg, and then make you wait three weeks to have your goods delivered. Because we are small and local, we can respond to the needs of our customers much more promptly, and at a fair and honest rate. Moving Connections is dedicated to bringing the highest level of local moving service to Utah families, individuals, and businesses. We are happy to provide you with straightforward, honest estimates with no added fuel surcharges, taxes, or equipment rentals. You pay for our 26 foot moving truck and laborers’ time, plus boxes and tape, that’s it. Moving Connections offers two different services for residential and business moves: the conventional full service move, which can provide a great deal of peace of mind, or a labor only move, which allows you to provide the rental truck like Uhaul or Penske or a Trailer or POD, thereby saving you money. 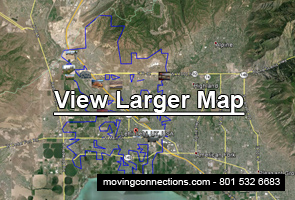 If Moving Connections is moving you to Lehi it's a perfect time to begin to utilize the many resources and bounties of Lehi. For example click on the picture to the left to go the Moving Connections 'Support - Advice - Assistance' page and discover Lehi for the first time. Once you are on the 'Support - Advice - Assistance' page go ahead and open the .pdf link found there and tape the list of emergency and useful phone numbers on your refrigerator. Moving Connections has gone to great pains to find those links and connections to integrate you quickly into Lehi life. The labor only move is a move in which you, the customer, provide the moving truck and driver, and we, Moving Connections, provide the expertise and muscle to perform the heavy labor and loading of the truck. This can save you a lot of money since you can do much of the packing of household goods, as well as renting a truck that you drive yourself. Moving Connections’ professional moving crew will wrap and pack all the heavy and unwieldy items – such as exercise equipment, heavy furniture, grand pianos, chandeliers, etc. – while you can pack the smaller and lighter items, such as clothing, kitchen items, and other things that need to be boxed. Our experienced moving team still loads all items according to moving industry standards, so your truck will be expertly packed with space efficiency and safety of your goods in mind. A typical truck rental for a 26 foot truck would be about $50-$60 per day, plus $0.70-$0.80 per mile, plus about $14 per day insurance (doesn’t cover cargo or any damage above the cab of the truck) or about twice that to cover the cargo (your goods), too. In addition, you have to bring the fuel up to the level it was at when you took it (they take regular fuel). These trucks, since they’re workhorses, get about 6-10 miles per gallon of fuel. So be certain to take all of these factors, especially mileage and fuel consumption, into account when budgeting for a truck rental. It takes some uncommon sense to run a successful business in today’s world. That’s why it’s important to select the right moving company when your business has to pull up stakes and move to another location. So why should you select Moving Connections as your moving company of choice? Well first of all, consider liability and coverage. Would you rather choose a moving service that is federally licensed, insured, and bonded, as is Moving Connections, or would you just like to “chance it”? Second of all, consider experience and professionalism. Would you rather select a moving company that hires only experienced professionals for its moving crews as does Moving Connections, rather than one that hires from temp agencies, or from guys holding up cardboard signs looking for employment in home improvement store parking lots? Third, consider honesty and straightforwardness. Would you rather hire a moving company that provides straightforward and honest quotes based solely on the number of hours of labor plus boxes and tape, as Moving Connections does, or would you like to have your quote swollen by fifty percent at the end of the job when they add on a fuel surcharge, fees for furniture dollies and hand trucks, plus phony taxes and junk fees? If insurance and coverage, experience and professionalism, and honesty and straightforwardness are important to you, then the choice is clear: Moving Connections is the way to go. When you’re thinking of moving your residence, think of Moving Connections. Why? Because of our pricing, professionalism, and performance. First of all, our pricing is not only fair and competitive, it’s also very straightforward and uncomplicated: you pay for time (labor and some of the driving time), plus boxes and tape. That’s it. You don’t have to worry about taxes, fuel surcharges, equipment fees, and other phony charges because there aren’t any with Moving Connections. Plus, our prices are probably the lowest for any shipper in Utah that is federally licensed, bonded, and insured, as we are. A second reason for choosing Moving Connections is professionalism. We hire only experienced professionals for our moving teams. That’s why we have the best moving crews in the state. The third reason to choose Moving Connections is for performance. We have raised the bar for performing moves quickly and efficiently, yet safely.